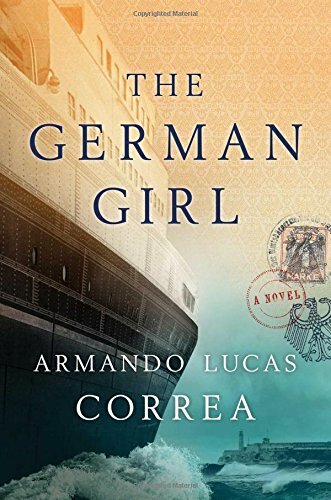 The German Girl (in Spanish, translated by Nick Caistor), is a novel with a purpose: To expose the atrocity of the S.S. St. Louis, whose 1939 voyage from Hamburg to Cuba exemplifies the fatal consequences of closed borders and failed humanity, of hope gone horrendously wrong. Armando Lucas Correa, raised in Cuba before emigrating to the United States, writes with a political agenda as well — to out Cuba not only for denying sanctuary to most of the St. Louis’s ill-fated passengers, but also for erasing the crime from Cuba’s history books. Cuba is not the only country with a selective memory. The United States, too, played a key role in the horrors that transpired, and was very late in coming to a public admission of guilt. Correa is a journalist. Among other professional activities, he is editor-in-chief of People en Espanõl. His first book, En Busca de Emma (In Search of Emma: Two Fathers, One Daughter and the Dream of a Family) is a memoir about the arduous and emotionally fraught journey of starting a family with his male partner. The German Girl is his debut novel. The novel alternates chapters between two narrators. The first is Hannah Rosenthal, a Jewish girl who is 12 in 1939, having lived a bourgeois existence in Berlin before the Nazis’ rise to power. Hannah experiences the world through smell. Two women on the S-Bahn give “off waves of sweat mixed with rose essence and tobacco.” Berlin after the November pogrom (Kristallnacht) — “a stench of broken pipes, sewage, and smoke.” Hannah’s childhood nanny, recalled through “the fragrance of her lemon-bergamot-cedarwood cologne mingled with the smell of sweat and spices.” Hannah also experiences the world through her beloved friend Leo Martin. Together they travel Berlin, hiding from the “Ogres” — her parlance for Nazis — and sharing a passion for adventure. The second narrator is Anna Rosen, an American girl living in 2014. She and her bedridden, widowed mother are enshadowed by 9/11. They live a sober existence in New York. Hanna’s sections are written in the past tense, Anna’s in the present. The parallels between the girls are many, sometimes tipping their similarities toward the contrived. Both have suffering mothers with whom they appear to have a strained emotional connection. Both idolize their absent fathers, each missing for different reasons. Both are only children. Both have a male friend their own age, though Hannah is much closer to Leo than Anna with Diego. Hannah lives with her parents: an anxious, self-centered opera singer mother named Alma Strauss Rosenthal (faint homage to Alma Mahler, perhaps?) and her father, Max Rosenthal, an esteemed university professor. As Berlin becomes increasingly dangerous, Hannah’s family — desperate to leave — secures passage on the St. Louis. Leo’s widowed father, too, manages to book passage for himself and his son. The voyage appears to bring escape and deliverance, but instead, it is their terrible misfortune to have set sail on a doomed ship. At the end of the book, Correa provides these facts — on May 13, 1939, the St. Louis sailed for Cuba from Hamburg with 900 passengers, the majority German Jewish refugees. It docked two days later in Cherbourg to pick up 37 additional Jewish passengers. All refugees had landing permits from the Cuban Department of Immigration, as well as U.S. entry visas. Cuba was intended as a transit point; passengers were to await emigration to the United States. A week before departure, Cuban President Federico Laredo Brú invalidated the landing permits. The St. Louis arrived in Havana early morning May 27. Only four Cubans, two non-Jewish Spaniards, and 22 refugees were ultimately permitted to land, despite efforts by relatives, and protracted negotiations with offers of payment by Lawrence Berenson, lawyer for the American Jewish Joint Distribution Committee. Ordered to vacate Cuban waters, Captain Gustav Schroeder made heroic efforts to find a non-German port to accept the refugees. He sailed for Miami, but the United States denied entry. A similar refusal came from Canada. Forced back across the Atlantic, the ship stopped in several European countries that agreed — following another intense set of negotiations — to take the passengers. Great Britain accepted 287; France, 224; Belgium, 214; and the Netherlands 181. In September 1939, Germany declared war. Other than the 287 taken into the relative safety of Great Britain, most of the rest of the passengers suffered the terrors of war. At least a quarter were exterminated by the Nazis. In The German Girl, Anna and her mother are shaken from their depressing existence by a set of photos they receive from the 87-year-old Hannah Rosenthal, who turns out to have been one of the “lucky” passengers permitted a landing in Cuba. Having spent her whole life there, she has now reached out to her great-niece (Anna’s father was her nephew). Anna and her mother travel to Cuba, where Hannah reveals her life story in a series of largely expository chapters. Sharing her great loves and tragic losses, she generously roots Anna in her father’s family and puts Anna’s mother on a path forward. The German Girl begs a different question. Given Correa’s professional credentials, might this book have packed more punch as nonfiction? Perhaps a futile inquiry, but Correa’s journalistic instincts are apparent not just in his clear reporting on the voyage of the St. Louis, but throughout the book. For example, he introduces Jehovah’s Witnesses to make the very important point that the Nazis singled this group out for torture and brutality due to their refusal to accept totalitarian authority. In Crossing the Borders of Time, journalist Leslie Maitland set out to find her mother’s teenage lover, lost to her when her family fled Nazi-occupied France. Her mother’s family was able to secure passage to Casablanca, and then to Cuba on the San Thomé in 1942. Describing the horrors of the St. Louis, Maitland notes the “infighting among unscrupulous officials,” Cuba’s corrupt immigration director, and the fruitless “frantic telegrams to President Roosevelt” and other world leaders. Scholar Peter Gay describes his Berlin childhood under the Nazis in My German Question. Like many other highly assimilated and non-religious German Jews — including Hannah Rosenthal’s family — in 1933 “We had suddenly become Jews.” Deeply interested in the psychological ramifications, Gay says he cannot write autobiography, his has to be memoir. His past has proven “to be a mosaic with central pieces missing.” He recounts his father’s daring maneuvers to secure passage to Cuba. Finally obtaining visas and tickets for the St. Louis, his father, having an eerie sixth sense, took a harrowing risk to fake documents for passage on the Iberia, which sailed April 27 (two weeks earlier than the St. Louis). The German-Jewish refugee community in Havana, numbering over three thousand, clung together and talked Germany: who was still caught up in the Nazi trap and what one could do to help…. Our ties to our former homeland…remained intimate and inescapable, a cause of wrenching anxieties. The crack of displacement — irreparable, as I have learned — also affects our most personal relationships, often shapes or destroys them. It makes our need for them so urgent — for who but the object of one’s love can soothe this rift? — and this urgency works against them…. The anguish of this rift is not appeased. That my mother loved me as much as she could seems to me beyond doubt, but her ability to give voice to her affection for me was compromised by her anxieties and her ailments. I can wander one last time among the colorful croton bushes, the poinsettias, the rosemary, basil, and mint herbs in the neglected garden of what has been my fortress in a city I never came to know. Correa deploys facts to honor his fictional subjects. In a heartbreaking appendix, he lists every passenger on the St. Louis. If this ship’s manifest is insufficiently potent, Correa writes to remind us of the deadly consequences of closed borders, neglected refugees, and maligned and forgotten immigrants. There are the makings of an explosive novel here, but Landis, having set the bomb in place and struck the match, declines to light the fuse. The CIA's Detention and Interrogation Program was, in every sense, a moral and strategic catastrophe. The danger isn’t knowledge, but rather the loss of privacy; a panopticon is damaging precisely because constant observation erodes a subject’s will to resist. Without privacy, we become conformists, our own jailers. I recently read you powerful book of ” The German Girl.” I can not help but notice many similarities from the movie ” Vogage Of The Damned” which was released in the mid nineteen seventies. Was your book based upon almost everything from this movie? I am sure you must have derived MANY details from the film….because I felt like I was reading your book all over again. Yes, of course, history is indeed the major part…….but, your characters are pretty much identical to this movie. A work of fiction based on reality….YES. But a work of fiction of yours alone?? I think not. Marcus has managed to craft a story so disturbing that it’s best told with absolute clarity.